Note: This is the first in a series of posts that I am developing. In this post, we discuss (and include the thoughts of other sports medicine experts) when athletes and sports medicine providers should use heat or ice. In future posts, we will address e-stim, ultrasound, dry needling, kinesio taping, and more. One of the questions I get from athletes, parents, and exercise enthusiasts centers on the perpetual debate about the use of heat or ice. “Should I use ice after practice or exercise?” “Can I use heat to warm up my muscles?” “Is heat harmful to injury healing?” While there is no universal consensus on heat or ice for every possible scenario and which is best for each, there seem to be some general principles. Rather than trying to explain them in my own words, I asked several people who work in sports medicine – athletic trainers, physical therapists, and massage therapists – for their thoughts. “As an athletic trainer working in an outreach capacity, I would say I use ice more regularly than heat. While we do have access to limited training room facilities, we are usually working more in a first responder/emergency care type of situation. Having said that, when dealing with acute injuries, heat is never indicated, as it will exacerbate any localized inflammatory response and actually make swelling worse. Ice is a cheap, effective, widely accessible tool I have in my belt for response to acute injury, soreness, swelling, etc. “This is a very common question with many misconceptions about the use of heat and ice. The old adage of icing for 2-3 days after an injury and then switching to heat is no longer the suggested plan of care. 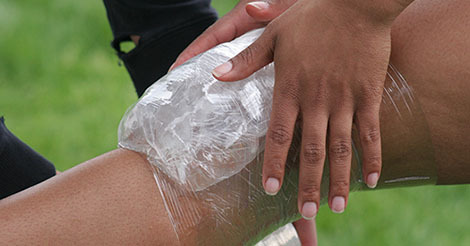 Ice should be used post completion, practice or exercising for joint and/or muscular soreness. Ice is also the most beneficial modality that you can use following an injury. Ice should never be used prior to a physical event or activity. I would suggest using heat prior to physical activity for muscular tightness in addition to completing a proper warm-up.